Inspired by Finding Nemo. I stuck the fish lemons and watermelon shark on wooden dowels painted black in front of a dark background. It seems your photography is coming on leaps and bounds Brian. Congrats on the new PB! Amazing. And so well done. Congratulations! I didn't vote but this would have gotten an 8 or 9 from me. GREAT STUFF. His teeth are strawberries, right? Fantastic setup and very well executed. very funny shot - i like it! This has a lot going for it. It's a "built" shot, but has great creativity behind it and an interesting approach to the challenge. The lighting is good too, with the only room for improvement being a bit more light on the left most fish. Great job keeping the melon lurking. The strawberry teeth are perfect and add great color. I think you might strengthened this a bit in terms of composition if you had done an angled shot in landscape format and filled the frame more, with the fish leading to the right and the melon to the left emerging from the shadows. Great shot though. Terrific! Great idea and BEAUTIFUL lightning. CONGRATS! HOPE YOU WIN! haha... i really like this one! Poor little lemonfish... totally unaware they are about to get eaten :( I like how the Melonfish is just barely peaking out of the shadows. This is incredibly well done. My favourite in the challenge. It takes but a moment to realize this is a masterpiece of veggie art. The strawberries make the perfect monster teeth. A little dark overall but that's the deep sea for ya. They look so blissfully unaware! Great job! A super great idea but I think the focus could be sharper and their is some grain in the 'shark'. I always hate giving advice on camera settings but I would venture to say that a longer exposure with a lower ISO rating may have helped with the graininess. My favourite - very clever and funny. Its astonishingly fabulous! It is by far the most creative and well put together scene! Im baffled with such an amazing composition! The best part: it only makes use of fruits and veggies! Totally meets the challenge! Awesome setup. 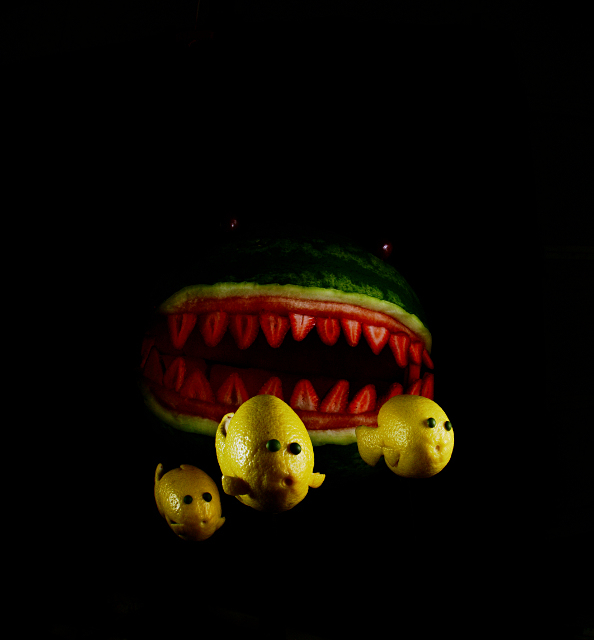 I would prefer that the eyes on the watermelon monster were brighter, but I do understand why you wanted to keep the photo dark. oo.. love the idea.. :).. but the lighting could be better.. Proudly hosted by Sargasso Networks. Current Server Time: 04/20/2019 04:48:01 PM EDT.